For months now we’ve heard that a new category of budget-friendly, sub- $200 gas-powered pressure washers is on its way. 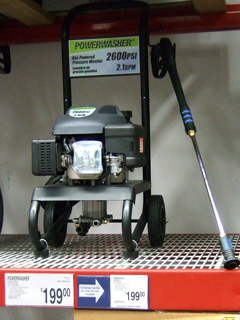 Today we spotted this new, $199 gas pressure washer at a local warehouse club. This unit costs about 1/3 less than any gas model we’ve seen in the past. Rated to deliver 2.1 GPM at 2600 PSI, this machine should give you roughly double the cleaning force of a typical electric pressure washer, at only slightly higher cost. Let us know if you’ve used one of these new, low-cost gas pressure washers and have any comments.